With winter still hanging on many of us may be fighting colds or flu. 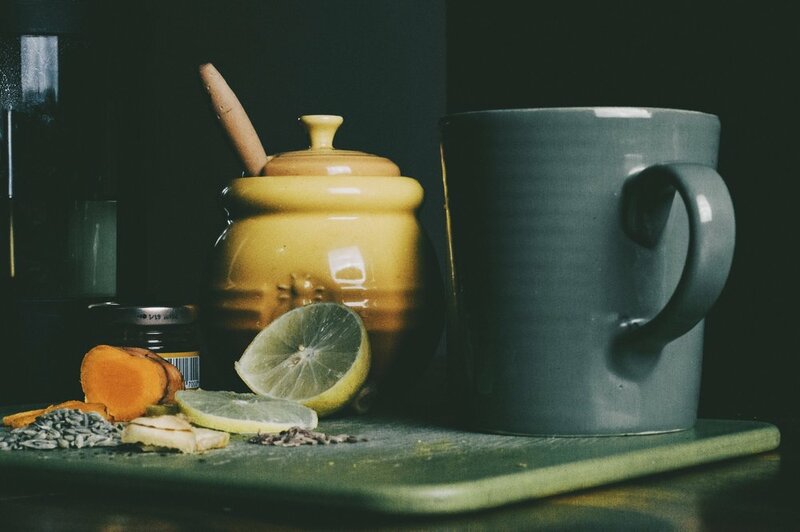 Check out Elizabeth Rider’s article on “Natural Cold & Flu Remedies to Feel Better Fast” from her website. I love using natural ingredients and ways to heal ourselves vs. turning to antibiotics or other OTC drugs, unless you absolutely have no other choice. Here’s Elizabeth’s list of the 6 Natural Remedies. Be sure to read the article! If you are limited on your budget and the fruit that is available to you, then you may want to stick with a simple smoothie. One of the easiest ones is a blueberry banana smoothie. You will need 1 cup of blueberries, 1 banana, 1 cup of plain yogurt, and 1 cup of baby spinach. You can use frozen blueberries if you need to. Mix the ingredients in a blender and enjoy. This specific smoothie has ingredients that can be purchased year-round and can help reduce your blood pressure within a few days. It can be taken daily and can also boost your energy levels. You also get a shot of iron with this smoothie that can benefit expectant mothers who may have blood pressure issues. When you think of a green smoothie, you may not think of berries with that. Berries are a great way to sweeten the taste. One smoothie mixture that has everything you need to reduce your high blood pressure does have that. 1 cup of spinach, 1 diced avocado, 1 cup of strawberries, and 1 cup of blueberries can be mixed with 1 cup of plain yogurt or water and made into the ideal smoothie to help reduce blood pressure. Frozen berries can be used and the other two ingredients can be found year-round at most stores. You can also make yourself a healthy smoothie that helps reduce your risk for getting diabetes, or is a smoothie you can have if you already have type 2 diabetes. When you have diabetes, keeping a healthy balance of fruit and vegetables in your diet is vital to your health. Depending on the type of diabetes and severity, you may find yourself having to check your insulin several times a day, or you may be in a position where you can lose weight and change your diabetes level. This is the ultimate smoothie for people who are trying to eat a superfood based diet. If superfoods are part of your routine, then you possibly have most of these foods already. Here are the foods that make up the smoothie, and the amounts of each one. Start with 1 cup of unsweetened almond milk and add 1 cup of fresh or frozen blueberries, 1 cup of fresh or frozen strawberries, 1 diced avocado, 1 cup of yogurt, 1 cup of spinach, and other greens you are interested in. You can also add some extra ingredients like protein powder, chia seeds, and even flaxseed. If you need something quick and simple to help you balance out your blood sugar, then there is an option available for you. It only has a few ingredients and is quick to mix up when you may feel the need to regulate or balance yourself. It includes 1 cup of fresh or frozen strawberries, 1 cup of plain yogurt, 1 cup of any milk you like, ice cubes, and extra ingredients if you choose. You can flavor this with other berries, or just leave it strawberry. Keep in mind for this smoothie to give you a regulated and balanced feeling, you will need to make sure that you use no additional sweeteners and that the milk and yogurt is unflavored and unsweetened as well. Most illness can be treated with a variety of smoothies and mixes. Gut health related smoothies are similar. However, if you want a full blown powerful gut healing smoothie there is a base that is ideal. This is the go to recipe for people having gut related issues. It contains 1 cup of full-fat coconut milk or 1 cup of almond milk, a handful of kale and a handful of spinach, 1 fresh or frozen banana, 1 diced avocado, a bit of ginger, hemp hearts, chia seeds, and bee pollen. For a sweeter taste, add in some honey as well. By drinking this smoothie daily, you can start to see an increase in your digestion, reduced stress on your gut, reversal of leaky gut symptoms, and an overall cleansed digestive and gut system. Lastly, you can also have a smoothie that is good for your thyroid. These include smoothies that are made with a lot of leafy greens and vegetables, especially spinach and kale, cucumber, avocado, and carrots. Add these ingredients with 1 cup of plain yogurt or 1 cup of almond milk. The holiday season is here. For many the mere thought creates panic or an anxious state of mind. No one can promise that all will go smoothly and everyone (especially you) will be happy. There are things you can do to make the season easier, brighter and merrier. Check out these 4 Tips for a Better Holiday Season. 1. Begin with Practicing Gratitude. Research shows that people who express gratitude can experience happiness that may last for up to a month! An experiment conducted by Robert Emmons Ph.D., Professor of Psychology at UC Davis, and author of The Little Book of Gratitude (2016); Gratitude Works! A 21-Day Program for Creating Emotional Prosperity (2013); Thanks! How the New Science of Gratitude Can Make You Happier (2007); Words of Gratitude Mind Body & Soul (2001); and The Psychology of Ultimate Concerns: Motivation and Spirituality in Personality (1999); found that subjects who made a daily list of things they were grateful for showed higher levels of optimism and enthusiasm, exercised more regularly and made greater progress on personal goals. This is powerful! I do this regularly only instead of making a list, I simply think about all that I am grateful for before I get out of bed in the morning. My day begins on a good note and I’m much more enthused and energetic. Compare this to waking up, groaning, and thinking about how much you don’t want to go to work, prepare for the holidays, begin cooking, go to a meeting, whatever it is you may dread. How do you feel if you think negatively first thing in the day? You are certainly not in a positive frame of mind. In fact, it’s beginning your day filled with negativity. You can change this. You can make a choice of what you think, what you are thankful for, and begin your day feeling good. Believe me you will be much more productive, engaged and happy. This may sound easy and perhaps not necessary to add since we all breathe everyday, all day. What I’m talking about is to stop…take a slow deep breath in through your nose and then exhale slowly through your mouth. Repeat 3-5 times. Be completely in the present moment with your breath. When you breathe like this you are turning on your parasympathetic nervous system.That is the part of you autonomic nervous system that slows down your heart rate and breathing, lowers your blood pressure, and sends extra blood to your stomach and intestines so your body can digest the food in your stomach. This is often called the rest/restore and digest response. It conserves energy and allows your body to restore itself and heal. The parasympathetic nervous system balances the sympathetic nervous system which controls the body’s response to a perceived threat and is responsible for the “fight or flight” response. When you are stressed or anxious about the holidays or any event (traffic jams, a complaining customer or boss, cranky child) all trigger the autonomic nervous system and prepares your body for fight or flight. Now that is good when it is a true emergency. However, our busy lives, tight schedules, never ending tasks, unrealistic expectations of ourselves, and limiting self-beliefs keep the autonomic nervous system on. Our bodies are not meant to be in the agitated state chronically. That causes a lot of damage to our bodies and if not controlled, can lead to chronic illness. When you feel yourself stressed and anxious, you cannot always think clearly or be creative. You may be more prone to snapping at others and saying things you later wish never were said. Notice what is going on in your body and mind. Then….simply breathe slowly. Determine what is most important for you and your family for a happy holiday. Dig deeper….what is the feeling you want, what is really important? Write that down. Think about it. What about that is so important to you? What would you gain if your holiday was just that? What would you lose if your holiday was just that? In a few words write what is most important for a happy holiday. Keep that in you mind, post it on the refrigerator, your bathroom mirror, by your bed…anywhere and everywhere you will see it to remind yourself. Now close your eyes, breathe deeply, and visualize that holiday. Visualize what it will take to have the holiday you’ve always wanted. Feel that vision throughout your body. How does it make you feel? Where do you feel lightness? Notice where in your body you are relaxing. Let the tension fade away. Do this visualization everyday to keep it close and remind yourself. Now compare that to your list of all the things you would normally do, or try to do. How does that make you feel? Notice the tension that may be starting in your body. Notice the thoughts you are having and how they are affecting your body. STOP! Now go back and visualize the holiday you really want and experience how that feels. Go to that list and cross off all the things you do not need to do if they don’t contribute to your best holiday. For example, baking all those cookies and pastries. Do you really enjoy doing that? If the answer is no, or you would if you really had the time, cross it off the list. Consider other options…only making 1-2 types of cookies, or buy them! Or maybe not have any at all. Have a healthier holiday. Be ruthless with this list. Don’t think or expect yourself to do everything! It’s all not necessary or possibly even doable. Sometimes it really is the small things that matter. Simplify this holiday season and have time to actually enjoy it! This is a really important step to do. Truly be realistic in what you not only want for your holiday, but what is truly reasonable to do or have. For example, maybe you wish your mother could be there, but she passed away last year. She cannot be there. However, you could honor her memory at this time of year. Maybe share stories of past holidays with her with your family. Or perhaps you cannot get back to your family for the holidays this year. That is what you want most. Realistically, you cannot be there. Get creative. What can you do that still honors the traditions in your family? Or what can you do to start a new tradition…one that makes you feel good and smile? Sometimes what is really the best is to simply be with your family and/or friends. What really matters is the quality time with them, not all the trappings of commercialism. Be there, truly there, in the present moment with them - that will make a beautiful holiday and memory. I strongly encourage you to find time for yourself. Be present, breathe, turn on the parasympathetic nervous system and relax. Simplify. Create space for yourself so you can be your best in all the holiday moments and those leading up to them. Wishing you health, happiness & joy! Check out this simple and helpful guide for exercising at your desk from Concept Seating. They are easy to do throughout your day. Many of us may sit for hours everyday. A sedentary lifestyle can lead to many chronic diseases like obesity, Type 2 diabetes, and heart disease. For your health please try these five simple desk exercises...they are simple to do! Please try them. Infographic courtesy of Concept Seating, a high back chair provider. Authenticity...Will the Real YOU Please Stand Up! There is a lot of talk and concern about being authentic, your true self; really allowing the real you to stand up and be present. Many articles and coaches discuss and write about how to truly find your authentic self. But what does that really mean? Do you know who you really are? Who you are to the core? What is your perception of yourself? And, is that perception true? All this can become a bit mind boggling! We all have beliefs and attitudes that shape our perceptions. Understanding where those beliefs stem from, how you got them, and taking an honest look at them can help you determine whether those beliefs, thoughts and attitudes contribute to your authentic self or if they lead you toward a false self perception. Let’s start at the beginning. Honestly answer these thought starter questions to evaluate your thoughts and perceptions as a way to determine how authentic or false your internal thoughts are…you know it’s that internal voice you hear. Write down your responses to refer back to them. Ready to test your thoughts for their authenticity? Think about a belief or attitude that you have of yourself. Is it true? Is it a fact? Is that thought or feeling verifiably true? How do you know? Does holding onto that thought or feeling serve you in a positive way? Does it contribute to your feeling happy, fulfilled, calm and peaceful? Are your thoughts and attitudes about yourself helping to keep you healthy? Do your self thoughts push you toward actions that put your well-being at risk? Do these thoughts keep you from being your best? Does this belief and feeling get you more of what you want, need and deserve? Or is it leading you toward or keeping you from taking the actions that would give you what you need? Now that you have some idea about which thoughts, beliefs and feelings may be self-limiting you may be ready to find your authentic self to live life to your fullest! Answer each question honestly. There is no right or wrong. These questions are about getting you to examine your core authentic self. Save your answers for further processing. Typically you gain your perspective of yourself very early in life as a small child. With very little life experience or insight, you may have interpreted someone’s actions or messages to you, particularly a parent or other important adult, in a negative way. That often was not the intent of the person sending the message but it was how you interpreted it. How does this happen? We grow up creating self-generating beliefs which we rarely truly test for truth. We simply adopt beliefs based on conclusions we made from observations/data. 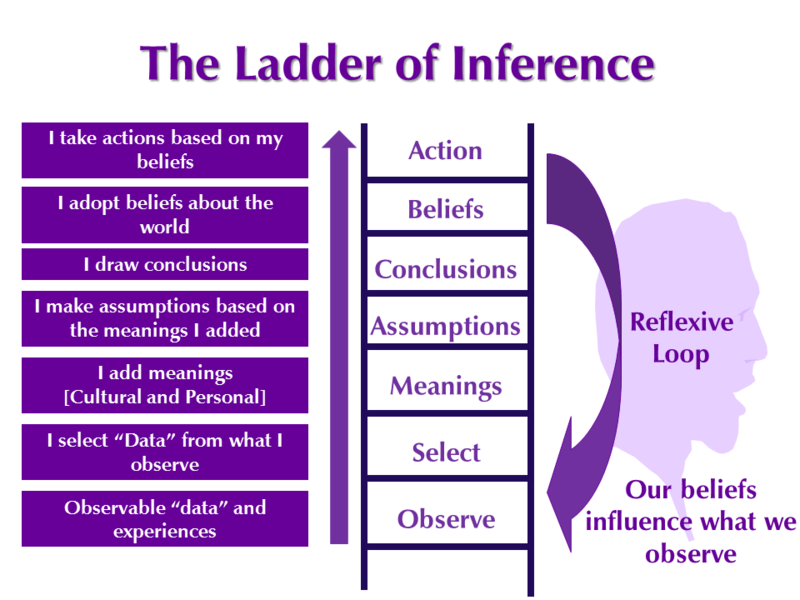 This phenomenon is called the Ladder of Inference (visual). We observe or hear a message “the data”, select some details about it and add meaning to it. Based on the meaning we attach, we then make assumptions about it. The assumptions become conclusions which we adopt as beliefs. The beliefs then drive our actions. Without truly exploring we adopt this as our belief about ourselves. Over time we continue to infer others behaviors in this same pattern and do not even realize we are doing it. Now as adults, these beliefs, which often are self-limiting and not true, are deeply embedded in ourselves. We accept them without questioning. All too often this holds us back, we may believe we are not good enough, not worthy enough. It’s surprising, actually shocking, how many of us are walking around with those beliefs! As a small child you “bought into” that negative message and labeled it….I am not good enough, not smart enough, not pretty enough, not athletic enough, I don’t deserve something better, I must be “bad”. The messages of our internal voices can easily turn into an inner critic. As a small child you interpret a situation or message without really examining it or questioning if it is true. This interpretation then leads to a feeling often inadequacy, lacking something, unworthiness in some aspect. Then when faced with similar situations, we quickly assign that same interpretation and feeling to it. This thinking becomes automatic without even being aware that you are doing it; it is subconscious. These thoughts and feelings become your beliefs, again without really examining it for the truth. You simply accept it as the truth. These beliefs can so easily become self-limiting. You begin to expect this in your daily interactions and life. These self-limiting expectations (beliefs) get in your way to fully living your authentic self. Authentic Self Questionnaire…Let’s take a deep dive into those and examine them! What does your inner voice say to you? What is the message? Think of a time, a situation where you listened carefully to that voice. Describe the moment as specifically as you can. What was the circumstance? When was that? Can you think back to the first time you received that message of your inner voice? What was going on? How old were you? Who was giving you that message…at least from your perspective at that time? How does that message make you feel? Is that message true? Is that really you? Or was it a message you received early in life and have grown to accept as truth? What would you like to say to that person(s) who gave you that message? Speak from your heart and tell her/him/them what you know about yourself, what is true about you. Let it out! Once you can pinpoint where those messages come from, it is easier to look at them and see them for what they are…simply our interpretations and assumptions, not necessarily the “truth”! To begin to live authentically you need to learn to be vulnerable. What??? You may be asking, who wants to be vulnerable? Doesn’t that just open myself up for hurt and pain? What the heck does that have to do with being authentic? From Brene Brown’s book, Daring Greatly, “What we know matters, but who we are matters more. Being rather than knowing requires showing up and letting ourselves be seen. It requires us to dare greatly, to be vulnerable.” Most of us would interpret vulnerability as weakness, when in fact it is just the opposite! And, it impacts us all! It’s not a choice. The only choice is how we each respond when we are staring at uncertainty, risk and emotional exposure. We each choose whether we respond with our authentic self and the knowledge that we are worthy or shrink away, or pretend to be someone other than ourself. Wholehearted living (being authentic) is about engaging in our lives from a place of worthiness. It means cultivating the courage, compassion, and connection to wake up in the morning and think, No matter what gets done and how much is left undone, I am enough. It’s going to bed at night thinking, Yes, I am imperfect and vulnerable and sometimes afraid, but that doesn’t change the truth that I am also brave and worthy of love and belonging. Vulnerability is the core, the heart, the center, of meaningful human experiences. Allowing yourself to be vulnerable allows you to be authentic. Let the real you live your life.